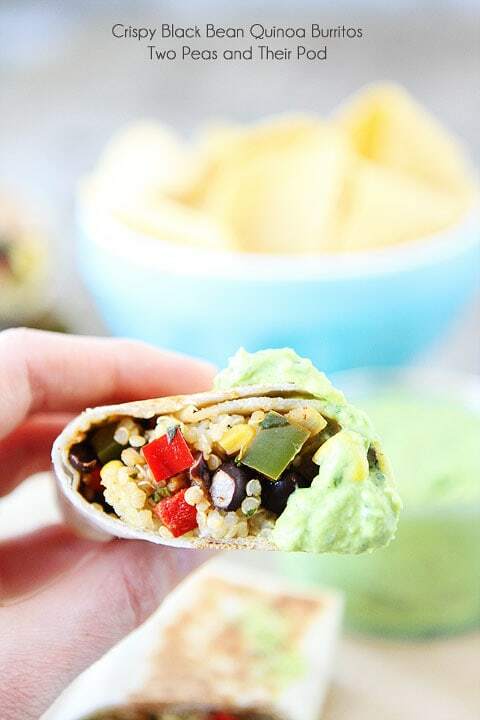 Crispy Black Bean Quinoa Burritos with Creamy Avocado Yogurt Dip are the perfect weeknight meal! What’s for dinner? Don’t you wish you always knew the answer to that question! I do! We cook a lot and sometimes we still struggle with dinnertime. Just because we have a food blog doesn’t mean we don’t eat cereal for dinner some nights:) We do our best to put a healthy and tasty meal on the table most nights of the week though. 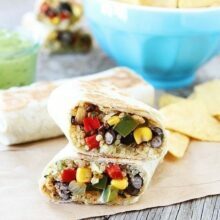 One of our go to recipes are Crispy Black Bean Quinoa Burritos. All three peas give this meal two thumbs up! If I had three thumbs, I would raise three thumbs. These burritos are that good! 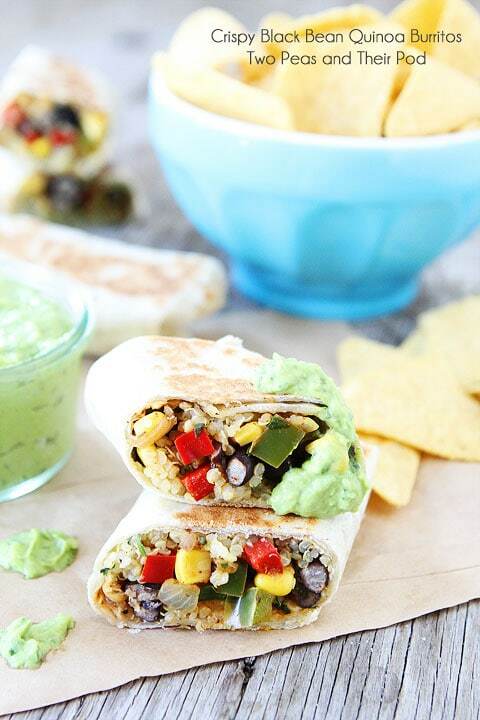 I love these Crispy Black Bean Quinoa Burritos for many reasons. They are easy to make, healthy, affordable, and filling! Oh, and did I mention delicious? Because they are! The burrito filling is colorful and full of flavor. 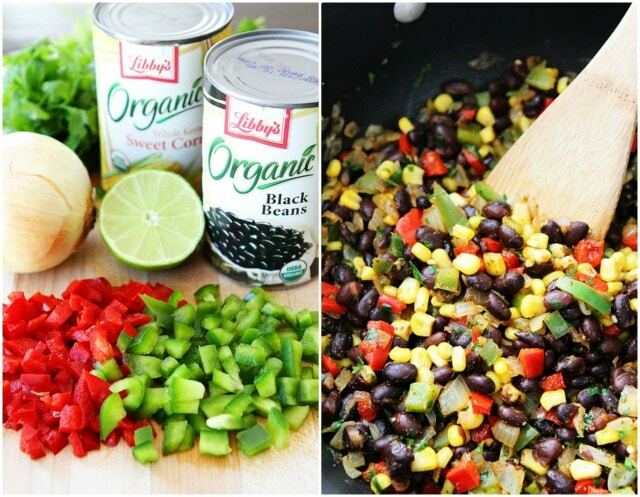 We use black beans, corn, onion, garlic, peppers, cilantro, chili powder, cumin, and lime juice. We also fill the burritos with Cilantro Lime Quinoa and a little bit of cheese. 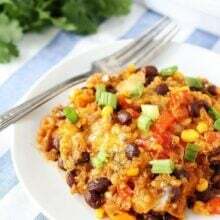 If you aren’t a quinoa fan, you can use our Cilantro Lime Rice, both are tasty! We roll up the burritos and heat them on a griddle pan until they are nice and crispy. You don’t need to fry the burritos to get a crispy texture. The griddle pan works wonders! And we don’t stop there! We serve them with Creamy Avocado Yogurt Dip. Dunking the burritos is Caleb’s favorite part! And we always make more than we need so we can have leftovers the next day. Work once, eat twice…so very nice! If you are not sure what to have for dinner tonight, I hope we just solved your problem. 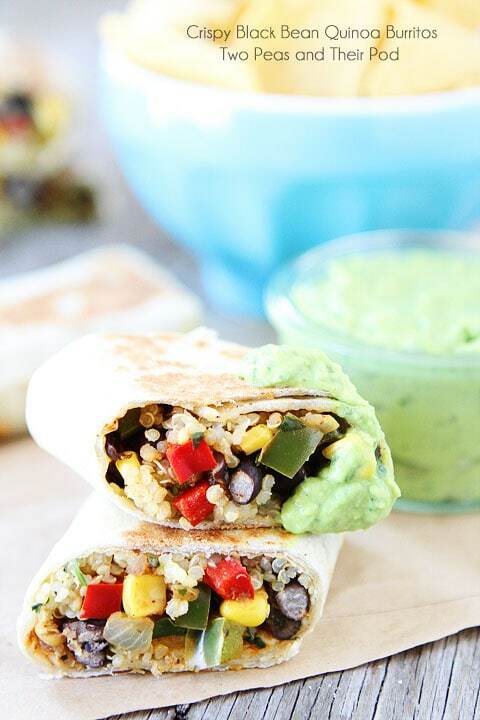 Crispy Black Bean Quinoa Burritos are the way to go! They make the perfect weeknight meal, especially since it’s back to school time! We know you are all busy! 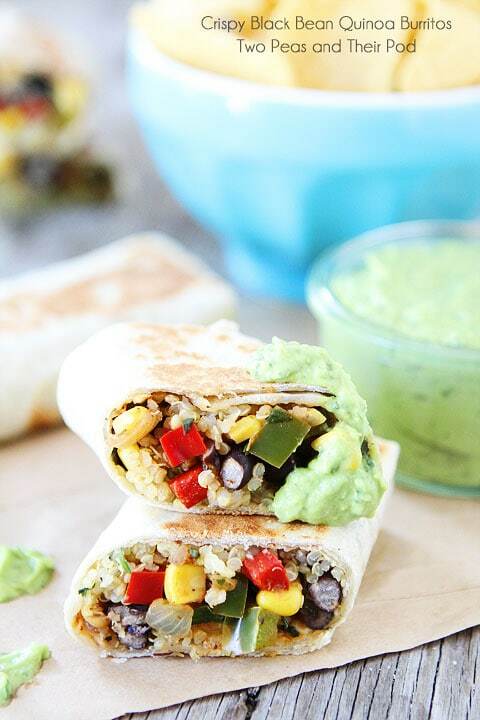 Crispy burritos with black beans, corn, peppers, cilantro, quinoa, and cheese. Serve with Creamy Avocado Yogurt Dip and you have a fun, healthy, and delicious meal! Note: You don't want to fill the burritos too full or they will be hard to roll up. You can also use Cilantro Lime Rice, instead of the quinoa. Disclosure: this post is sponsored by Libby’s, but our opinions are our own. This looks so yummy! I have never made quinoa before, I must get some and try this recipe. 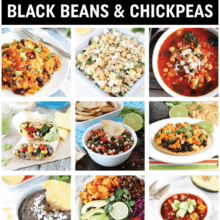 I think black beans are about the best things ever. Thanks for another yummy post! Wow, now I’m craving Mexican! You know what we’re having tonight!! This looks delicious!!! Burritos,fajitas, tacos—smethingTexMex 🙂 –are our weekend go-to meal. too. training for a marathon and this would keep me going! There certainly can not be enough quinoa recipes. Looks delicious and healthy! I love making all my burritos warm and crispy!! These are right up my alley and I love them! Such a perfect, filling, and healthy dinner idea! Thanks, Maria! Those look great!! Can’t wait to try at our house! What a fun weeknight dinner! My kids could eat burritos every night 🙂 Looks great! Nice and easy and tasty! Yum!! I know my family would go crazy over these! Love this! Easy weeknight meal is always a plus for this household! The word “crispy” makes these sounds beyond delish! Totally drooling over that creamy avocado yogurt dip, too! My kind of weeknight dinner! These look fantastic! Would you suggest freezing them or no?? I made quinoa salads cookies and quinoa and zucchini patties and it’s so healthy and delish ! This is a perfect way to use things that I have on hand in volume at this time of year… the CSA delivery will supply me with almost everything the filling calls for… can’t wait to do this one! I love the idea of putting quinoa in a burrito. And the dip sounds fabulous too! What a cool idea to use quinoa instead of rice. Such a perfectly healthy meal! My go-to weeknight dinner is my creamy chicken and sausage pasta. But I’ve gotta try your quinoa burritos soon. It could be my new favorite! I love quinoa and I have everything on hand. Dinner solved! Thanks. My family would love this! Great tip about the griddle! I just made this and it was FANTASTIC!!! Thanks so much for all of the inspiration and great recipes. I am trying to lose a few pounds and I’m following myfitnesspal. Could I have permission to post this their with your name on it. Or would you be willing to? It would be a huge hit I bet. Any chance you know the nutritional values of this delicious sounding recipe? looks like my kinda meal! Burritos are always a favorite for dinner around here! They make everyone happy…especially when they look like a rainbow like these do! 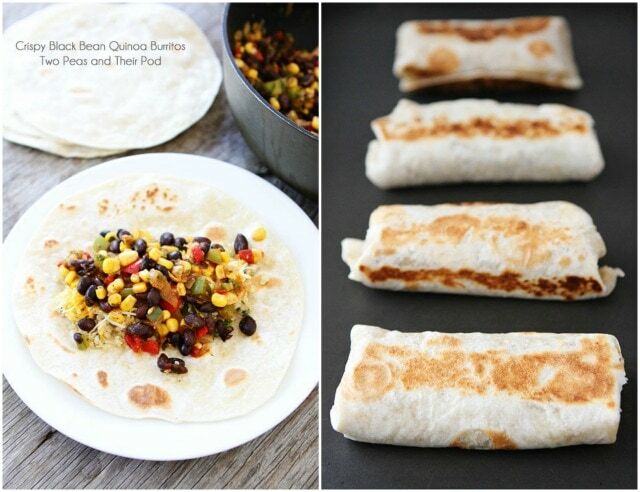 THESE BURRITOS LOOK VERY EASY AND YUMMY. I HAVE MOST OF THE INGREDIENTS IN THE PANTRY ALREADY. AND YES THEY DO LOOK LIKE A RAINBOW…… DOUBLE YUMMY! I really need to try these with the quinoa instead of rice. They look delicious! I make something similar and it is so delicious! And oh would I love to win a food processor. I have asked for one for Christmas for years now and everyone thinks, why do you want a nice food processor? I tell them my life would be so much easier with one! We whip up our own homemade garlic hummus with boiled chickpeas in a food mill and fry eggs in olive oil. A spread of the hummus on pita bread and toasted in olive oil with runny eggs is a yummy week night dinner! Didn’t know Libby’s made beans/corn. I always forget to include corn in Mexican dishes but it makes such a difference. Avocado is a given and always key! These look awesome! Burritos and tacos are my go-to dinner too! You guys always share the best vegetarian dishes! I had a friend just ask me if I had any good vegetarian dinner ideas and I directed them to your site! These burritos look so tasty! I have only started eating quinoa a few months ago, and I am addicted. This looks great! OMG!!! just made these!!! so yum!!!!! and so love your blog!!! yay!! We made these the other night and they were great!!! We didn’t have enough cilantro for the called amount and used maybe half that each of the recipes called for and still worked well. Thanks for posting! Had these for dinner tonight. They were great! Think these could be made ahead, frozen and then cooked (minus the avocado dip)? 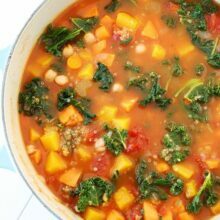 After seeing your 31 days of vegetarian meals post, I made these for dinner last night (with sweet potato instead of bell peppers) and they were delicious! Turns out my 1 1/2 year old loves onions and quinoa – who knew? I can’t wait to eat leftovers today for lunch! They look delicious! But isn’t is bad to use food packed it cans? I saw in another post that these are a great freezer meal. This might be a silly question, but do you brown them up before or after the freezer? just curious, since I will me making this for my dinner and dont have rice/quinoa. Do you think couscous can work? Do u happen to have nutritional info for this recipe? These are a great idea and a method I’m sure I’ll use again and again. I made guacamole instead of the crema just due to preference. An easy meal, and the leftovers made for great lunches- just threw the leftover veggies and quinoa together in individual portions and they were perfect. looks good!! can you puree this recipe?? When I think of Burritos I think about this huge brick stuffed with rice, beans and meat. In other words, not the healthiest of option.